Mohammad Yousuf (previously known as Yousuf Youhana) has been the most consistent performer for the Pakistan side since his debut in 1998. Until his conversion to Islam, he was one of the few Christians to play for Pakistan.Stylish, composed and a natural stroke-maker, Yousuf has been the pillar of the Pakistan batting line-up with Younus Khan for sometime now. He is strong through the covers and is elegant while using his wrists to flick the ball off his legs. He is quick between the wickets as well. He has shown a hunger for big runs when he broke Sir Vivian Richards' world record for the most Test runs in a single calendar year. Now a senior in the team, Yousuf’s name is surely going to be written in the annals of Pakistan cricket.e is particularly strong driving through the covers and flicking wristily off his legs and brings with him as decadent and delicious a backlift as any in the game. A tendency to overbalance when playing across his front leg can get him into trouble. He excels at both versions of the game, and in one-day cricket can score 20 or 30 runs before anyone notices.In 2006, Yousuf truly came of age in a record-breaking year. He began by plundering India and continued in England, not just scoring under pressure, but scoring big. A double ton at Lord's was followed by another big hundred at Headingly and the Oval. He rounded off a fantastic year with four hundreds in three Tests against the West Indies, a feat that took him past Viv Richards's long-standing record of most Test runs in a calendar year and also saw him establish the record for most Test hundreds (9) in a year.But his surprise exclusion from the 15-man squad for the 2007 Twenty20 World Championship led him to signing up for the Indian Cricket League (ICL). 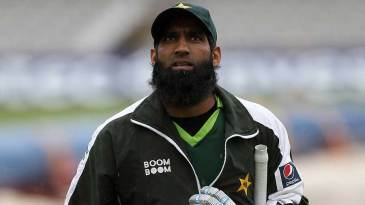 Though the PCB persuaded h Find Mohammad Yousuf profile and stats of batting, bowling and fielding including latest updated news of Mohammad Yousuf, videos and images at Hamariweb.com. 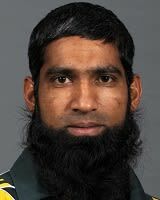 Also find detail Player profile and career statistics of Mohammad Yousuf of Pakistan. He was a great legend cricketer, i like his natural batting style which is very popular and many of the youngsters follow the batting style of him. FVjOT5 I really liked your blog post.Thanks Again. Much obliged. Bhai yousuf mujeh apki bating itni pasand hay k jb ap out hotay thay mujeh kuch honay lug jata tha plz come back to pakistani team .and i saw you bhowana. Mhr khawar shahzad jappa from thatha fateh ali. i love yousif bhai,.youshif bhai khuda ap ke lumbi umer kiray mn ap ko bhoat miss kirta ho.ap say milny ke bhe bhoat bhoat umeed hy q k ap humary jammat k admi hn.Allah ny ap ko apny rasty pay lagay.mera name mohsin rafiq hy or mn 1st year k stdn ho. know he is speaking bit in favors for Pakistan. we should support Pakistan team for all this..
i think he must be in test team he is still very god if he can clear his fitness test , then i think he can play .. he is a world class player who score tuns of runs for Pakistan.. i dont understand why he is always after afridi ..just because he is still in team. afridi always prove himself that he is fit and performance is also not that bad..
Mohammad Yousuf - Find Mohammad Yousuf of Pakistan Cricket Team complete player profile, number of matches, runs score, wickets & catches, Statistics, Records, Mohammad Yousuf Latest News, Mohammad Yousuf Videos, Mohammad Yousuf Photos, and other Mohammad Yousuf Cricket Team players.